middle of 2nd century B.C. Burr, Terra-cottas from Myrina (MFA), no. 094. Statuette of a draped standing woman. She has her right hand on her hip and with her left she is holding her himation from the inside. She is looking to the left. 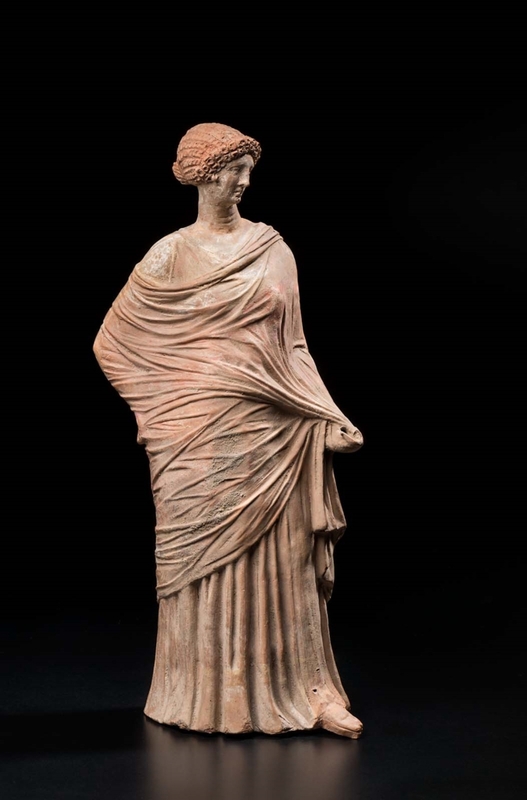 She is wearing a chiton and has an himation over it, wrapped around her body, leaving her right shoulder exposed. Her hair is wavy and drawn back to a knot behind with two rows of curls around her face. She is also wearing earrings and thick-soled shoes. The figure belongs to the group of draped women who were found in graves and were the companions of the deceased. She is missing the thumb of the left hand and the fan. Parts of the body are mended. Traces of pink on flesh, reddish-brown on hair, yellow on chiton and traces of colour on the himation too.